This morning when i started the eclipse and tried to refresh the contents from salesforce server, i got an error something like “com.salesforce. ide.api.metadata.types. Metadata$JaxbAccessorF_fullName cannot be cast to com.sun.xml.bind.v2.runtime.reflect.Accessor“. I started searching for the solution and found below solution on salesforce community. Note – I was using Windows 7 operating system. In short you can say that you need to downgrade JDK installation. However, uninstall and re-install would have been taken much of my time and therefore i started to search for the different solution and found below method and Solution 2 – worked for me!!! Use the -clean command of eclipse while opening. It can be done by adding the attribute “-clean” in the shortcut icon of the eclipse. 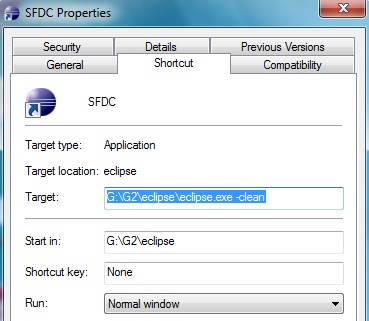 as you can see in below image , right click on eclipse shortcut and add the “clean”. What does mean by : -clean argument? If you are having problems getting the system to pick up your new plug-in, then perhaps your configuration is out of date. This might be the case if you just unzipped a new plug-in into your /plugins directory and started up…Eclipse had parsed and cached the list of plug-ins that were previously in that directory and now it has changed without it recognizing that fact. You can clear any per-configuration cached data by using the -clean command line argument. Note that -clean flushes the registry caches (amung other information) and forces the plug-in manifests to be parsed in order to regenerate the registry. This is not optimal for everyone all the time because (depending on the size of your development environment) it may take up to a couple of minutes. Case : If you have more than one JRE installed. 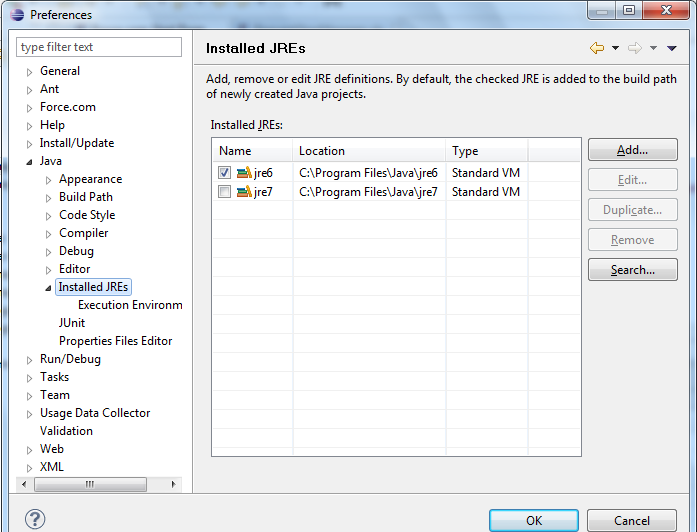 In Eclipse “Windows | Preferences | Java | Installed JREs“, select JRE 6, if entry is not visible and JRE 6 is installed then manually add the JRE and select. Go to eclipse shortcut – edit the path at end, add “clean” word as shown in image. Let me know if you face difficulty. where i find sfdc properties window………. This is very generic question. Please visit http://boards.developerforce.com/t5/General-Development/bd-p/general_development to get detailed information on above topics. You are awesome !! Solution 2 worked for me too ! Use Eclipse 3.6 – HeliosDownload JRE 6 from Java site and install it. place this line in the file. Now create a new Force.com project and try saving the contents .It will do without any errors now. Solution 2 Works for me.. Thanks, adding “-clean” parameter worked for me. I was not getting any error message. The refresh for existing project was working fine for me. While creating new project, after components selection it was not proceeding further. Nothing was happening after clicking on ‘Next’ button. The issue is resolved now.